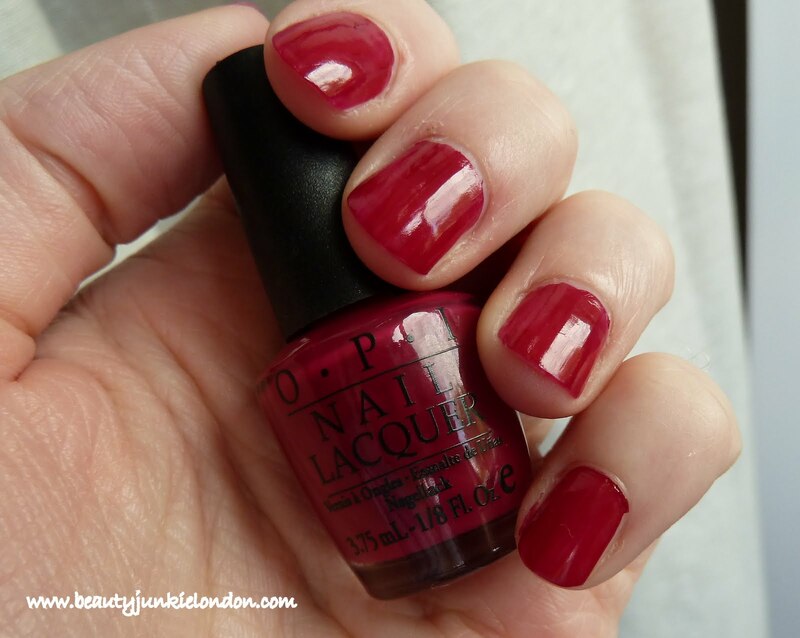 I have no idea what OPI colour this is – I picked it up when I went to Hydrohealing in Nottinghill for a facial. They had a small selection of mini OPI colours on the counter for about £3 and this colour caught my attention so I bought it. But it doesn’t have a name on it – so if you have any ideas which one it is I would love to know! The picture is just one coat, which was pretty good but two would be better. Applied well and dried fairly quickly. I really like the mini bottle of polish that some brands do (Mavala, OPI and Essie in particular) as it’s a much better way to pick up colours I want to try but know I’m never going to finish a whole full size bottle. If you have a clue what colour this might be please let me know! Or not. I’ve just realised it was last updated in 2007. Sorry! Sorry. I’m not good on OPI. Minis come from special seasonal collections usually. This could go way back??? A recent one is Off with her Red but this looks too dark to be that.